Take the R24/N12 towards JHB International Airport. The R24 heads left towards the airport. Keep straight on the N12 heading towards /Boksburg/Benoni/Witbank. You are now on the N12 to Boksburg/Benoni/Witbank. Your first turn off to Boksburg is the "Jet Park" offramp - this is also called the M44. Go past this offramp - do not exit here. You want to take the next offramp (ie, not the Jet Park offramp). The next offramp is the RONDEBULT offramp - this is also called the M41. PLEASE NOTE: Keep straight as the road runs parallel to the N12 for just under a kilometer before heading up left to RONDEBULT road. At the T-junction turn left and cross over the highway. 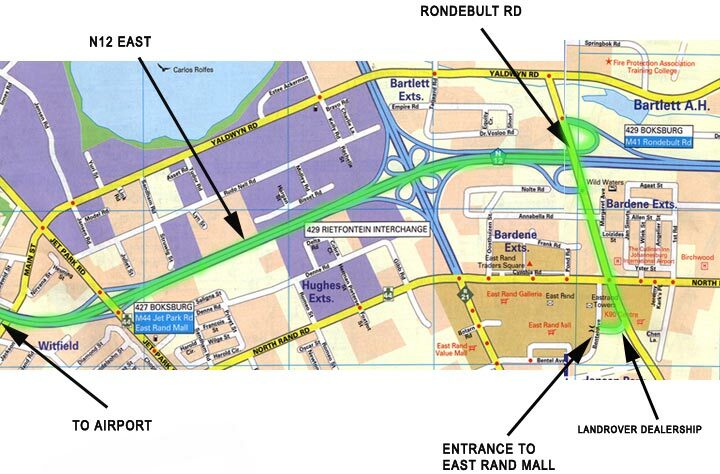 Ok, you now have now taken the RONDEBULT road offramp and crossed over the highway. Go through two sets of traffic lights. At the third set of traffic lights turn right (LAND ROVER DEALERSHIP IN FRONT OF YOU) and carry on straight through the gates into the East Rand Mall parking. You are now at the East Rand Mall. Entrance # 3 is straight ahead. You will see the Ster Kinekor signage in front of you.